Seed a prompt box and say goodbye to writer’s block. The other thing I discovered: If I had a topic to begin with, it was easier to get started. Sometimes with writing, getting started is the hardest part. You feel this energy inside you, this impulse to write, to spill words and sentences and paragraphs onto a page. Electric with excitement for the brilliance in your mind, for the genius you will share, you sit down to write. You stare at your blank screen. Your white sheet of paper. You think, “What was that idea I had in the shower? The beginning I thought of as I fell asleep last night?” You stand up and pace. You think. You sit down again. Most writers know this feeling. I certainly did. Then I remembered my prompt box. I abandoned my writing practice in the second half of 2014. I was too drained to come up with ideas, and I filled that time slot with other things. I missed writing, though, and so on January 1, 2015, I resolved to begin practicing again. To start small and write ten minutes per day. Each morning, I place my cheap composition book (the kind with the black and white marbled cover), a uni-ball Signo 207 pen (blue), my iPhone (4), and a metal Chinese tea tin (filled with folded slips of paper) on the smooth surface of my breakfast table. I set my phone’s timer for ten minutes, press start, touch my pen’s tip to a fresh sheet of paper, and I write. I don’t lift my pen from the paper except in the spaces between words, and I scribble until I hear the chirping of my phone’s crickets. Sometimes when I sit down to write, I jitter with anticipation: my head is filled with thoughts and I can’t wait to clear them out. To stick them to paper so they’ll quit moving around in my brain. Other times times my mind is blank, and I don’t know how I’ll begin. At those times, I pop open the Chinese tea tin — my prompt box — without concern for how I’ll start. It is written right there on paper for me. A prompt box is a vessel — a felt hat, a cedar cigar box, a copper cookie tin — that you fill with favorite words, vivid verbs, and phrases that stimulate you. Prompts in my box include ink, thunderstorms, and my dream about being a whale. To make a prompt box, you will need a container and 20-30 slips of paper. To seed your box, make a list of 20 things you love: moss, mountains, bacon, brioche. The word “dastardly.” Write each of your words or phrases on a slip of paper, fold the paper, and drop it into your container. That’s it. It’s really that easy. A prompt box is continually being subtracted from, but also added to. When you’ve used a prompt, remove it from your box. Then, when you are out in the world, whether hiking, exploring antique shops, eavesdropping on conversations in a coffee shop, or watching an acorn roll across the sidewalk, make notes of images, words, or statements that strike you. 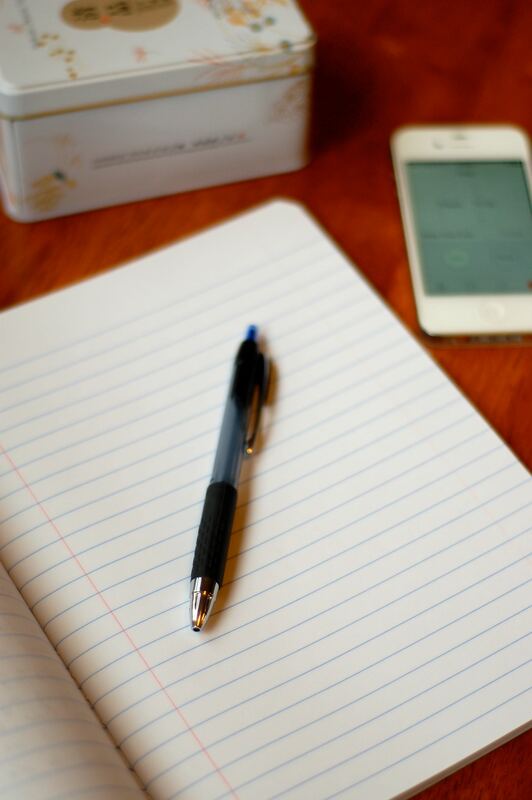 Record a voice memo on your phone or scribble a phrase in a notebook you carry with you. When you return home, add those mementos to your prompt box. With a prompt box, you will always have a place to begin. So far this year, 21 days into 2015, I have managed to stick to my resolution. I have written at least ten minutes a day, sometimes with an idea already in my mind before I start the clock, but more often by the grace of my prompt box. When I feel blank, I scrape the metal lid off the tin and it clatters on the table; I stir the slips of paper with my fingers, pull one out, unfold it, and wonder with a thrill, what will I write about today? How do you begin when you are feeling blank or blocked? Share your tips with us! I keep a continuous file of striking words and phrases. I periodically go back and reread, for ideas on those tough writing days. Very good idea!!! I might try it!! Great idea. I’ve been suffering from this for weeks now. I want to write and have several ideas, but when I sit down to do it, I come up with nothing. So just like you said here, I’ve been replacing writing with other things, but have found that there is no replacement for writing. Same here Mewhoami! I wonder how can I keep writing if I can’t build on whatever I have in hand! is that the so called writer’s-block? I feel I am ‘story-less’!! Exactly. So much to write, but the words don’t want to flow. This is indeed a splendid idea! Loved the idea Andrea! Really. but how you keep rolling to have more ideas on what you are going to write?! that specific feeling stops me because at that point I am always ‘sentence-less’,’Word-less’,’Thought-less’. Really! so how do you live with that? This is an excellent way to keep track of thoughts! I often think of something and say to myself, “I’ll remember this!” But I don’t. So writing thoughts down instantly works, and it’s a great idea. I don’t have a prompt box, but I grab my phone and make notes as the thoughts present themselves. But I like the idea of the prompt box and will use it in the future. Hey, that’s a simple yet a very practical and “do-able” idea. Let me try it over next 30days and see the results. Thanks for floating the idea. I save phrases and striking words that catch my attention immediately in the ‘Notes’ on my iPhone. Then I regularly scroll through for updates and ideas. Easier for me than keeping note books. This is a wonderful idea! Plus, I love how you’ve described that feeling of being able to write ‘nothing’ even when your mind’s so full. Thanks for sharing the box thingy, I am actually going to do that! Also, I need to google dastardly. i really like your posts! i’m a fan (not a ceiling fan!)! reply please! This is such a good idea! I always have trouble remembering what I wanted to write about and am always looking for inspiration! Thank you for this idea! I also keep prompts from ideas I get at those odd moments. Mine are not in a box, though that’s a great idea and I have a cool box a friend gave to me. I keep mine in a zipper folder from the office supply store. I do something similar, but virtually. When I think of an idea I want to write about, I start a blog post, but the idea as the title and then save it as a draft. Then it’s sitting in my drafts until I’m ready to write about it. I also keep notes on my phone with ideas. This is such a great idea. Thank you for the inspiration. I’m going to try this – even though we’re approaching the 21st day of the year already. Loved the piece. Think I will give it a try. I try to write each day, first thing in the morning with a cup of tea nearby. The ideas seem to come to me at that time. I just note whatever pops into my mind, things my cats did that were funny or just something that happened the day before. Works for me. So good idea to write with the real writing tools. This is a great idea! I’m going to start right away! The way you started talking about how electric and brilliant and palpable your ideas seem until you sit down to compose them made me laugh out loud—too true! I love your ideas for creating a prompt box. When I feel blank and blocked it often means that I’m taking myself too seriously; it may be time to go wash dishes, rummage through the refrigerator, or walk along Lake Michigan…. Drawing, painting and gardening are activities that wean me into a relaxed alpha (?) state where snippets and random verses float through my head. After taking a break from a blue-footed booby painting, I went outside and played Tom Sawyer as I brushed white paint on a bamboo fence. As I painted with relaxed attention to my task, snippets of a poem about blue footed boobies floated through my head. Every so often I stopped and scribbled down the next few lines then resumed painting. This happens often, and I am blessed that words tumble so freely via this method! Thanks for a great post – It will be fun to create a prompt box and see what results from that incubation chamber! I use Google Keep for exactly this purpose on my phone. Half the trick is to write enough down to recall the idea you had properly.